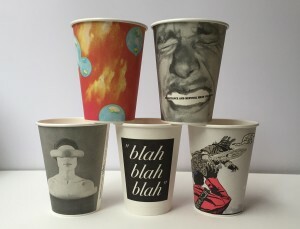 IMPRINT coffee cups (left to right) by Susan Fenton, Virgil Marti, James Mills, Dotty Attie, Kerry James Marshall, Edition of 250,000; distributed at coffee shops throughout Philadelphia for the duration of the exhibition. In 2002, The Print Center organized IMPRINT: a public art project, for which a series of temporary public art projects were commissioned from Dotty Attie, John Coplans, Susan Fenton, Kerry James Marshall, Virgil Marti and James Mills. The project included 46 billboard and bus shelter posters, six collectible inserts in the Philadelphia Inquirer Sunday magazine, and 300,000 printed paper cups used by coffee shops throughout the city. Curated by Joan Wadleigh Curran and Jacqueline van Rhyn, this enormous project established The Print Center as an important curatorial voice on the role of print in contemporary art. The coffee cups created for the project were widely collected and are held in the permanent collection of the Victoria and Albert Museum, London.